Welsh Mythology tells us the story of Mabon ap Modron or the "the Great Son of the Great Mother". Mabon was born of Modron at the beginning of time. 3 nights after His birth, He was stolen from his mother. The story of Mabon's return begins with a man called Culhwch (KESH-lookh). 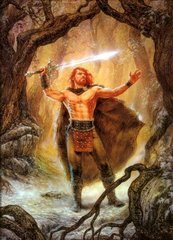 Culhwch had a curse laid upon him that he should take no bride other than Olwen, daughter of Ysbaddaden (iss-pa-THAW-then), the Giant Chieftain. No man had ever gone to the giant's fort and escaped alive, for Ysbaddaden knew that he would meet his death upon the day his daughter wed. He set 39 impossible tasks for each would-be suitor, if he was able to survive the initial meeting of Ysbaddaden. If the suitor were able to complete each task, he would then have to bring the head of the Great Boar, Tyrch Trwth (terkh trooth). For between the ears of this boar lay a brush, comb and razor, the items which must be used to prepare Ysbaddaden for his daughter's wedding. Culhwch accepted each challenge and confidently vowed to complete each quest victoriously. He was accompanied by his cousin, the great King Arthur of Legend, and Arthur's Companions. They set out to find Mabon, for he was the key to their success. They wandered the earth searching for the Oldest Animals, and ask them if they could remember what happened to Mabon. The Blackbird of Cilgwri (kil-GOOR-ee) was the first of the Oldest Animals that Culhwch and his Companions found. The Blackbird told them "I have been here a long time. When I first came here, there was a smith's anvil, and I was a young bird. No work was done on that anvil except for when my beak lay upon it in the evening, and today there is not even a nut of it that has not been worn away. But in all that time, I have not heard of Mabon, son of Modron". And since they came with King Arthur himself, the Blackbird directed them to go to the next of the Oldest Animals, the Stag of Rhedynfre (reh-DEN-vray). The Stag was equally unable to help them on their quest and told them, " I have been here a long time. When I first came here, there was only one small antler point on each side of my head, and there were no trees here except for a single oak sapling. That grew into an oak of a hundred branches, and the oak fell and wore away and today there is nothing left of it but a red stump. But in all that time, I have heard nothing of Mabon, son of Modron." And he directed them to the next Oldest Animal. The Owl of Cwm Cawlwyd (coom COWL-id) was next and said to the Companions "I have been here a long time. When I first came here, I was a young bird, and this whole valley was an ancient forest. People came and cut down all the trees. In time, a new forest grew up, and then new people came and cut it down, and this now is the third wood. And look at me! My wings are worn to mere stumps, I am so old. And in all that time, I have heard nothing of Mabon, son of Modron." And the Owl told them to seek out the Eagle of Gwernabwy (gwer-NAH-bwee), the oldest of them all. Upon finding the Eagle he told them "I have been here a long time. When I first came here, I had a stone so tall and high, that from its top I could peck at the stars, and now it is worn away so small that your hand could cover it. And in all that time, I have heard nothing of Mabon, son of Modron." Discouraged, the Companions prepared to leave, but the Eagle of Gwernabwy stopped them saying: "That once he flew as far as Llyn Llyw (shlin shloo) seeking food. I saw a huge silver fish swimming in the lake. I tried to catch him, thinking he would make a tasty dinner, but he pulled me under and I barely escaped with my life. I gathered all my kin to seek vengence, but he sent messengers of peace. He came and asked my help in removing tridents that had been thrown at him. I pulled 50 out with my talons, and we became friends. Perhaps he might know of Mabon." The Salmon of Lyn Llyw told them "This is what I know, every high tide I go up the river to Caer Loyw, and there I hear the sounds of such suffering that never in my life heard such distress before." The salmon then took two of the Companions on his shoulders to the wall of Caer Loyw, where he had heard someone grieving since his earliest days. When the Companions heard the lamenting voice, they asked who it was that grieved so deeply. It was amazingly Mabon Himself, painfully imprisoned with no hope of escape. Culhwch and his Companions battled for the release of Mabon and won his freedom. As a token of his gratitude, Mabon joined Culhwch and helped him to win the hand of the lovely Olwen.